Will Burrard-Lucas likes to photograph unsuspecting African animals with strategically placed camera traps. For his latest project, the wildlife photographer sought to capture images of nocturnal animals as they conduct their affairs at night, and the results are spectacular. Burrard-Lucas, with the help of African Parks and Norman Carr Safaris, recently undertook two expeditions to Liuwa Plain, a remote national park in the west of Zambia. His goal was to capture striking images of animals in low-light conditions, which can be a formidable and technically challenging task. 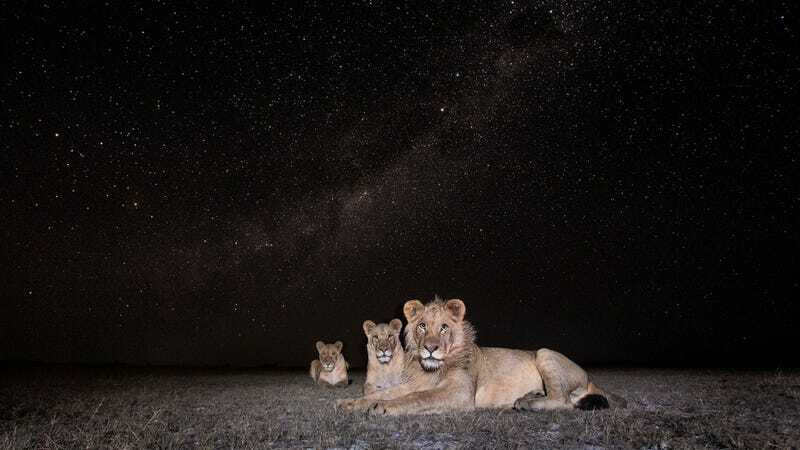 During his first night in Liuwa, he managed to photograph a pride of lions (shown above in the banner), which turned out to be one of his favorites from the project. He also snapped some cool solo shots. In the image directly above, some of the hyenas moved after the flash, forming the ghost-like figures to the left and right of the hyenas at the center of the photo. By setting up his Camtraptions camera traps near a watering hole, Burrard-Lucas managed to capture images of a porcupine and a zebra going in for a sip. Zebras aren’t particularly known for being active at night, so the image caught the photographer by surprise. The photograph below, showing a group of reedbuck as they were backlight by flames, is particularly stunning. He managed to grab some other sweet pics as well. You can find out more about this project, and the techniques Burrard-Lucas used to capture these photos, at his blog.